(IVORY COAST)- Cote D'Ivoire or Ivory Coast in english, is a country located in West Africa. Their culture is divided within 4 regions, being the Akans the biggest one. 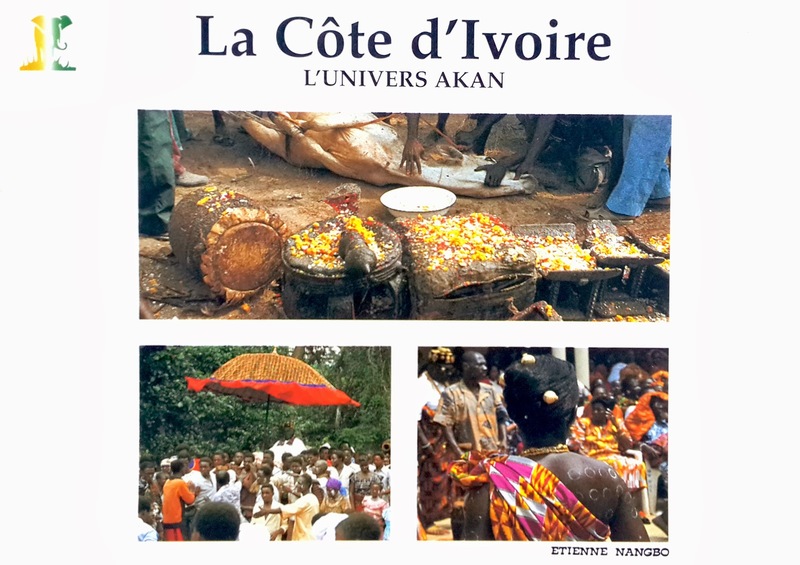 The Akan is an ethnical group within Ivory Coast and Ghana. 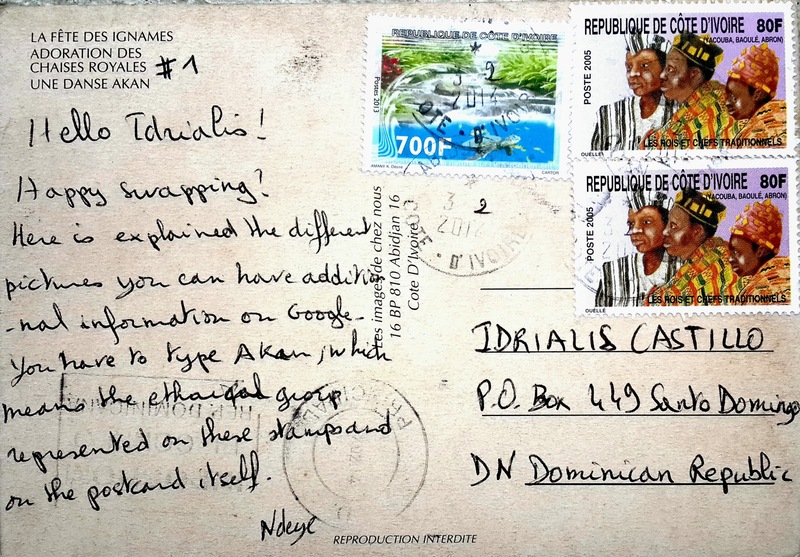 This postcard shows three images of Akan culture: the feast of yams, one of the biggest events of the Kingdom of N'dénian; it's a festival where all the sons and daugthers of the kingdom get together around their sovereign to give thanks to the ancestors and spirits while dancing and mashing yams. The second image shows a workship to the royal sun; and the third image is a typical akan dance. As Ndeyl recommended me, I googled about it, but you should definitely watch some Youtube videos like this one. (COSTA DE MARFIL)- Costa de Marfil es un país ubicado en África occidental. Su cultura está divida en cuatro regiones, siendo los Akans la más grande. Los Akans son un grupo étnico de Costa de Marfil y Ghana. Esta postal muestra tres imágenes de la cultura Akan: la fiesta del ñame, uno de los eventos más importantes del reino N'dénian. Es un festival donde los hijos e hijas del reinado se reúnen alrededor del soberano para darle gracias a los ancestros y a los espíritus, mientras bailan y majan ñames. La segunda imagen muestra un culto de adoración al rey del sol; y la tercera muestra un baile típico akan. Como Ndeyl me recomendó, googlié sobre la cultura los Akan, pero definitivamente, deben mirar videos en Youtube, tales como este.